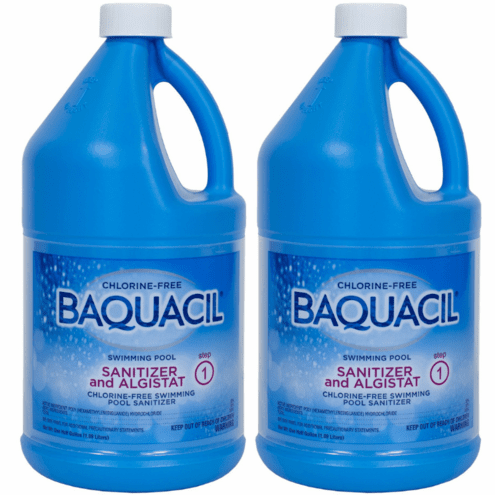 Baquacil Pool Sanitizer is the best Non-Chlorine pool water sanitizer for both Above Ground pools and In Ground pools. Gentle on all pool surfaces such as vinyl liner, concrete, painted pools, fiberglass pool, etc. 1/2 Gallon per 10,000 Gallons of Pool Water. Sanitizer level should reach 50ppm. Add 1 pint per 10,000 Gallons to raise Sanitizer 10ppm. Sanitizer level should not be lower than 30ppm. 50ppm is the ideal level.